The Food Splurge...it starts each year in November as we celebrate my husband’s birthday. One dessert here, a great glass of wine there. Then it’s Thanksgiving, and the holiday season is in full swing. There always seems to be something to toast! Then in January for one week, I ate my way through London. Okay, I’m not going to lie. I’ve overindulged! Upon return I wanted to eat clean and lean. What I was craving was one of my favorite soups that's light, satisfying and delicious. And by the way, it’s also quick, easy and oh so versatile. The cast of characters, in the order of their appearance: (front row) 3 tablespoons olive oil; the Mirepoix - 2 cups onions, 1 cup celery and 1 cup carrots, 1 bay leaf; (second row) 2 quarts chicken stock; (third row) 1 cup diced tomatoes with their juices); 1 cup cannellini beans; 1 tablespoons kosher salt & 1 teaspoon black pepper; 2 cloves minced garlic ; (fourth row) 1 1/2 cups broccoli florets; 2 heaping cups ( 2 oz) spinach; 6 tablespoons mixed chopped herbs. This recipe is merely a base on which to build a soup. Use your favorite vegetable combination or whatever’s on-hand in your refrigerator. Substitute any stock flavor you’d like. 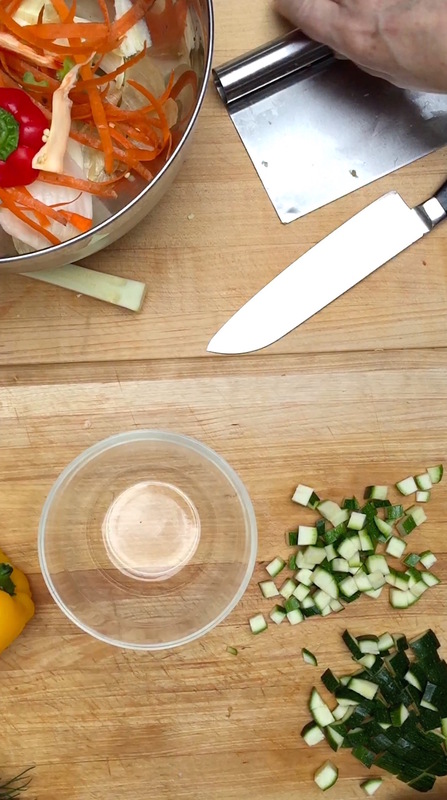 Add your favorite garnishes and seasoning at the end. Anything goes! Let’s get started. Every great soup starts with aromatics, a combination of vegetables and herbs, that when cooked in oil begin to soften and release their flavors and aroma into the dish. Commonly used to create a perfect harmony of flavor as a base for soups are onions, celery and carrots with the addition of herbs and spices. The ratio of these 3 ingredients is 2-1-1. That’s 2 parts onions, 1 part celery and 1 part carrot. 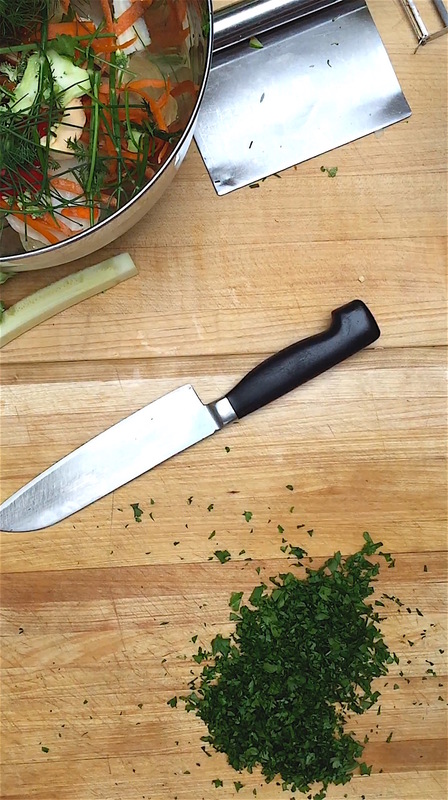 It’s called a mirepoix, which is a foundation in classic French cooking. 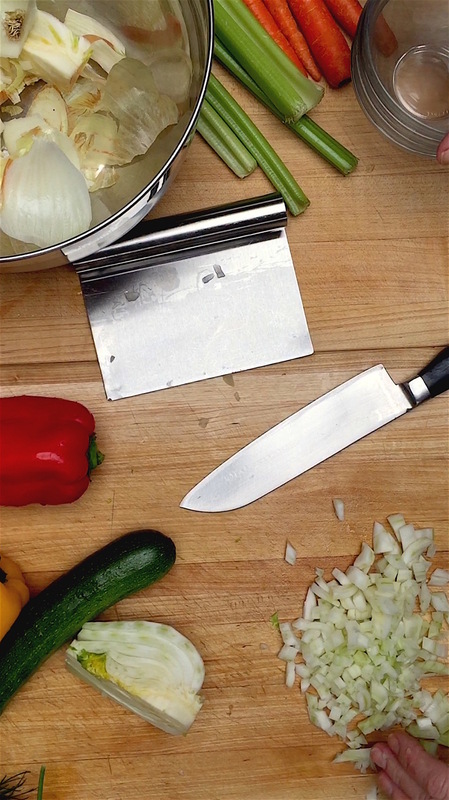 For the purpose of soups, the vegetables should all be cut in a consistent small dice, to cook quickly and evenly. Once you get your mirepoix lightly sautéed, you add the stock, bring it to a simmer and cook until the vegetables are almost cooked through. Then add the remaining ingredients in stages. Stir and cook for another 5-8 minutes. You are shooting for vegetables that are JUST cooked, because this is what gives this soup a fresh flavor and texture. 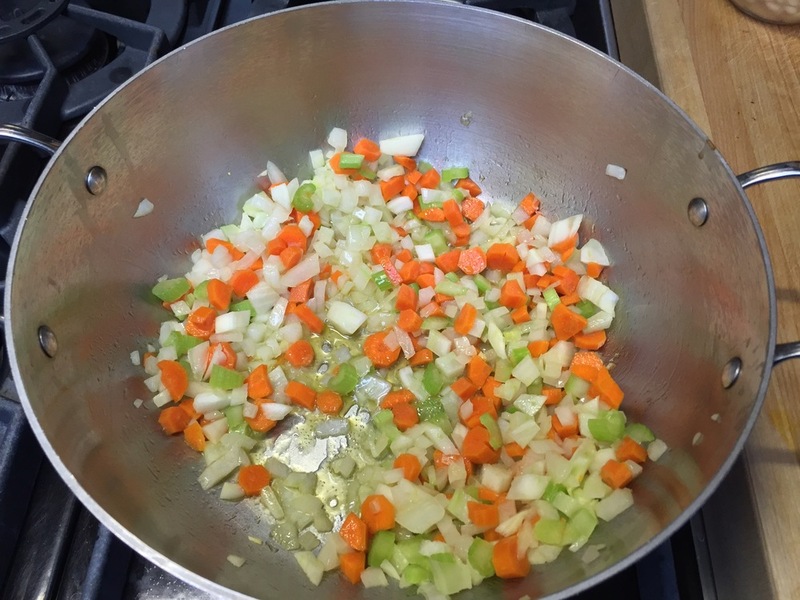 The mirepoix - onion, celery and carrots sautéing in olive oil for 5 minutes. Add chicken stock and bring to a simmer, cook for 5-7 minutes more. Soup simmering for 5 minutes with the addition of tomatoes, broccoli florets, cannellini beans, salt and pepper. Add spinach, herbs and garlic. Simmer 5 more minutes or until the vegetables are just cooked through. Ta-da...my version of a quick & light minestrone soup! Heat olive oil over medium heat in a 4-quart saucepan. First add onions and sauté for 1 minute, then add celery, carrots and bay leaf; cooking until the vegetables begin to soften about 5 minutes. Add stock, stir and bring to a simmer, 5-8 minutes. Add tomatoes, cannellini beans, broccoli florets, salt and pepper, stir and simmer for 5 minutes. Add spinach, herbs and minced garlic, simmer for another 5 minutes or until the vegetable are just cooked through. To add more protein, or to make this recipe heartier chicken can be added; either shredded or diced. Some delicious garnishes are grated parmesan cheese, lemon zest or a dollop of pesto, stirred in. -It's no secret that using the best ingredients will produce the best final product. Agreed? Now that we've got that covered we can move forward. Whenever possible I will buy the freshest ingredients I can; and if I have homemade alternatives in the pantry or freezer, they're my first choice. But we are all so busy and need to have choices for the sake of convenience. -Making items from scratch, like stocks for instance, offer us control over flavor and the purity of our ingredients. -In the winter months I rarely use fresh tomatoes, so the alternatives are canned. For this recipe I used canned petite diced tomatoes. Make it easy on your self, prep the soup ingredients the night before. Store each ingredient in a plastic bag. All bags will fit in a 1-gallon bag with zipper seal . 1. It keeps all your ingredients together and neat. 2. This helps contain the aroma of the raw onions! Homemade soup will be on the table in no time. Newer Post3 yoga props i can't live without!